ExtensionEngine Blog Virtual reality at Penn State — Why bother? To give the presentation some context — and at the risk of simplifying something complex — a team at Penn State University applied virtual reality to their geoscience program by creating a Virtual Field Trip (VFT) to replace in-person visits to a geological site. They were there to show us how the VFT impacted learning outcomes. During the presentation, as I was actively jotting down ideas I could bring back to the ExtensionEngine team, Penn State displayed a slide that caught my eye. Why bother? Why bother applying virtual reality to a geoscience program? Why bother using innovative technology? Why bother looking for ways to improve learning outcomes? Excellent questions for the faculty, instructional designers, and higher ed leaders sitting in that room. Students in the geoscience program were expected to actually visit this geological site as part of their study. However, gathering students at the same time was, unsurprisingly, challenging. And when they actually got to the site, the sound from the highway they were standing next to was distracting. Not to mention, students at different campus locations didn’t have access to this location. This is a long way of saying that every student had a different experience, and this resulted in varying levels of engagement. It was likely impacting learning outcomes. New learning sciences and innovative technologies are enabling institutions to create immersive, and yet scalable, student experiences that are improving learning outcomes. The Penn State VFT is a great example of doing this at the classroom level, but this is also happening on larger scale. For example, one of our clients, MIT’s Center for Real Estate, brought an urban planning program to life through an immersive, multimedia platform which allows students to “visit” cities virtually. This presentation is a reminder that if you’re not onboard with innovation in the classroom, and innovation in the industry, you’re leaving opportunities on the table. And despite what you may think, your current learning strategy may not be working. Thus, you might be impeding the learning outcomes of our students. 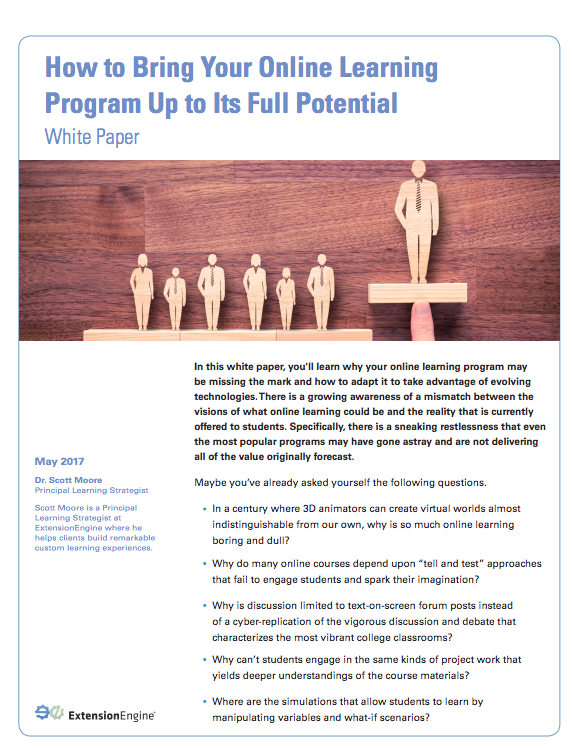 Continue Reading: Designing a course around “what am I able to do?” produces an entirely different product than designing around the more meaningful question, “what learning experience would be best for the student?” This white paper will help you understand how to adapt and take advantage of evolving technologies.